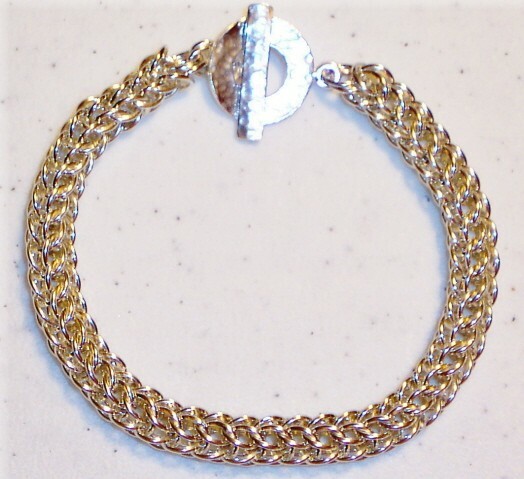 The Full Persian Bracelet is beautiful and comfortable to wear. It is sometimes called the Foxtail weave. The bracelet is a rope-type chain that looks slinky and lays smoothly along your wrist. It can made in all sterling silver, all yellow gold filled and also in a two-tone striped design of sterling silver and yellow gold filled. There are three size choices available, ranging from large to a micro. size. It is an intermediate chain mail weave. Nice companion pieces are the Graduated Full Persian necklace and earrings found in their respective kit sections. The clasp is not included in the kit.